This site is maintained by Adil Hasan Mhaisker. Here I post things related to technology (mostly Computers), which I get into trouble and google won't give me straight and direct answers to. So, to not let this happen to other people, I put such things here which can save time for many people. Heaven and Paradise. Are they same or different? This post will tell you the difference between Heaven and Paradise in Islamic context. The Holy Quran contains these two different words which are present in many verses. The Arabic word "SAMA", translated to english "Heaven" means the Sky/Space where the sun, the moon, planets, stars, galaxies, etc are present. In many places in the holy Quran, you will find the word Sama with the arabic word Ard (Earth), for eg, "samawati wal ardi... (heavens and the earth)". The Arabic word "JANNAT" translated to english "Paradise" means the place built by Allah (s.w.t) for the righteous; the gardens beneath which the rivers flow. The place of eternal peace and desires. The opposite of the word Jahannam (Hell) is Jannat and not Sama. If you get the following error while getting new theme or plugin or whatever directly from wordpress, the resolution is very simple. Although, you will need root access to your server. You need to give full rights (rwx) on the DocumentRoot folder (where you have kept all wordpress files in server), or just change the ownership of your DocumentRoot folder to the web-service (www-data in case of Ubuntu). Once you get the proper ownership, just try downloading the theme or plugin or whatever again. And now it should download directly without requiring any FTP connection. WordPress has a feature called MultiSite, which is often confused for “multiple websites (domains)”, but is in fact “multiple sub-domains”. Although many people look forward to have multiple websites (with different domains) with wordpress to install on single server, but there is no simple solution from WordPress yet. This post will help you in configuring multiple domains using wordpress on single server. We will be using Linux server (Ubuntu) with Apache 2.2 and wordpress 3.5.1 for our example. You can use the same idea for different OS and IIS (or other web server). 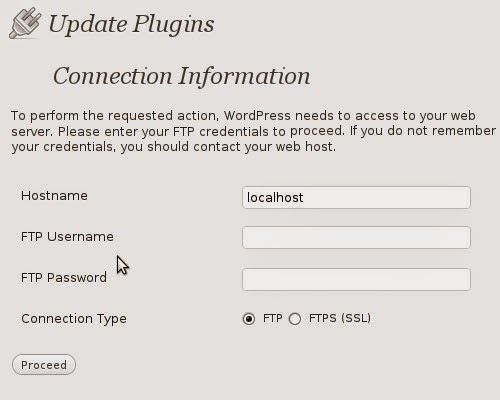 NOTE:Backup your wordpress directory, wordpress database and web server files and directories before continuing with the steps mentioned below.